Smoke Trails is XPresso preset for fast creation of pyroclastic trails. TP Trails is main object, which enables you to quickly and easily generate Thinking Particles as trails. Objects must be part of Mograph (Cloner, Fracture, Matrix) objects. In addition, it offers 10 settings of the Emitters. TP Collision is an object that generates particles only in the area where the dynamic object touches the other. It can be used with the object Sparks or with Wispy Smoke and Pyrocluster for interesting smoke / dust trail. TP Emitter is an object that generates Thinking Particles. It has several basic settings for controlling particles. Friction & Scale provide possibility of two forces. Friction is a drag force that slows down the particles. Scale has independent settings for all particle sizes. Dead Zone is an invisible ball, which destroys the runaway particles. It is a perfect for getting rid of too many particles that are slowing down our scene. Pyrocluster create 2 new objects Environment and the Smoke Particle Geometry, which are essential for rendering Pyrocluster materials in Cinema 4D. Offers four main categories (Global, Shape, Age, Shadow) setting for optimal regulation properties of the material. Sparks is a object that create sparks geometry. It allows you to change the spark's geometry, and to change the basic properties of Sparks material. So the color, brightness and 3 parameters for Glow option. Wispy Smoke is object that for the geometry of particles place the standard omni lights that are visible and form a more gentle smoke. This object simulate gravity forces. It has five controllable parameters. With Wind object you create different atmospheric effects such as wind and turbulence. You need Cinema 4D r12,13 (PC, Mac), Studio package (including Pyrocluster and Thinking Particles). 1. 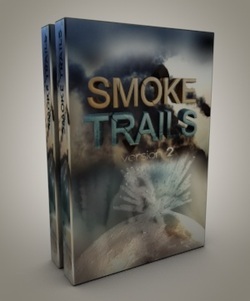 Download file Smoke Trails 2 and extract it.